Krista Donaldson is CEO of D-Rev, a company that provides medical equipment for those living on very low incomes. In this interview she talks about how attention to design detail has been critical to scaling up her social enterprise. The text of her comments and more details of D-Rev’s work can be found below. Let’s say you have developed a great prototype, but it needs to get to market. It needs to get to commercialisation. We have a real gap right now of groups that will support the unsexy part of product development. My plea is – particularly to funders – to focus on that valley of death between proof-of-concept to commercialisation. It needs to be supported. Without it, there is no impact at scale. D-Rev is a non-profit social enterprise. Our innovations are products that empower people living on less than $4 a day, and we work in medical devices. There are more than 4 billion people in the world that live on less than $4 a day. In many cases they don’t have access to clean water, to health products, to all sorts of basic items that can improve their lives. And with good products, they can be more productive, their children can go to school, they can better take care of their families and have jobs outside their home. There are three things to know about our products. The first is that they’re world-class, meaning that they perform on-par or better than the best products in the market. Products serving people living on less than $4 a day tend to be low-tech or low-quality, and we’re saying no, you can design the very best products for poor people. Second, they need to be market driven. Third, they are user centric. This means not just designing for the end-user, but designing for everyone in that customer chain from the purchasing decision maker to the repair technician. Brilliance is a phototherapy device, which is blue light to treat severely jaundiced babies. We licensed it to the largest maker of neonatal equipment in India, Phoenix Medical Systems, and we fixed the price so that there is price-transparency, which is very rare with medical devices. But we also said, “If you sell to public or rural hospitals, we will take smaller royalties.” Brilliance is now in more than 16 countries and has treated over 20,000 babies in its first year-and-a-half on the market. Another product we’ve designed is the ReMotion Knee, which is a prosthetic knee for above knee amputees. 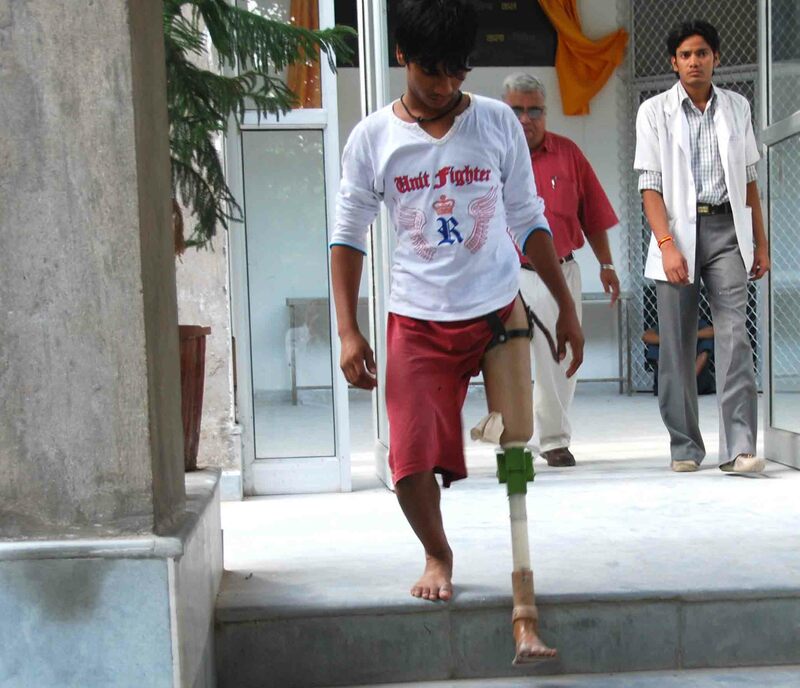 We worked with the Jaipur Foot Clinic, and they have fit the prosthetic on over 6,000 amputees. We think about the entire product lifecycle – not just the design of the product but the problem we’re trying to solve and how we achieve impact. It’s a four-step process. The first step is “identify,” which is about understanding what the problem is, who the users are, what the markets are, and what the price point needs to be. The second step is “design.” Design is what you traditionally think of with product development. It is brainstorming around the crazy far-out ways we might be able to solve this problem. It’s prototyping, iterating, and talking to users to get to a final embodiment that will go commercialisation. The third step is “deliver,” and this is manufacturing, distribution, marketing, sales. If you’re looking at medical devices, it is also regulatory issues. You need to be thinking about the delivery phase as early as possible in your design process. The fourth step is impact measurement. Are you in fact solving the problem you set out to solve? At the end of the day, you want to make sure your target users are using your product correctly so that you are creating impact – and that needs to be measured. Wherever possible, we design impact assessment into the products themselves. Brilliance, the phototherapy device, self-tracks, so we know from the device how much it is used, which enables us to calculate the number of babies treated by Brilliance units who otherwise would not have received effective phototherapy. From those numbers we can estimate the numbers of deaths and disabilities averted. One of the things we recognised very early on in D-Rev is that we can’t do everything, particularly around delivery. We work with all kinds of partners. We work with NGOs, for-profit companies, and faith-based organisations. What we’re really looking for in our partnerships is the best entity to help us achieve our mission. That means getting the products to our target users. A great example of that is Phoenix Medical Systems, our Indian partner for Brilliance. They are a for-profit and we get a lot of questions about why we work with a for-profit and whether we are using philanthropic funds to support a for-profit’s work. We raise philanthropic money for our “identify and design” phase, which is like product R&D. But once the product hits the market, it needs to be entirely economically self-sustaining. In using the private market to deliver our products, we need to design not just a very affordable product, but an affordable product that has profit margins built-in so that if D-Rev disappears tomorrow, the product will continue to be sold because the financial incentive structure is in place for that. We are structured like this because we think it is the best way to scale our products. It also holds us accountable to making sure that we are actually designing a product that solves a problem. When you have partners that are working together to bring a product to market and when you have all the incentives lined up and everybody has a skin in the game, that’s how you solve the problem and that’s how you get the products to impact. 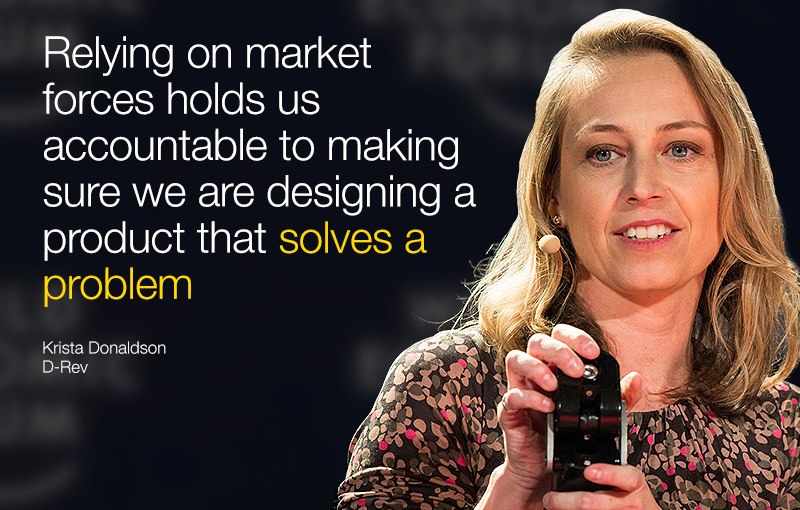 Author: Krista Donaldson is CEO of D-Rev and a 2014 World Economic Forum Technology Pioneer. She writes about the background to her work in Building better healthcare from the bottom up.